Paris Fashion Week is one of those glamorous events that makes Paris sparkle even brighter through the magazine pages. For a photographer, fashion week is that time of the year when you can capture incredible moments by just waiting outside a show venue. Nevertheless, you get to experience the real magic, once you’re in. When I came to Paris two years ago, I started collaborating with bloggers who would get invitations to shows and who would get me in with them. In the beginning I would always sit with the audience. However, as I got more experience, I started shooting from the pit. I became one of the tourists. “Tourists are people who are not professional photographers. They like to play professional photographers and they would argue that they have every reason to be there,” as British photographer Frazer Harrison says in an interview with Fashionista. Before you get a reputation and become famous, you would always start out as a tourist. On average, 50 photographers are present at each show according to runway pit photographer Dan Lecca in his interview for Man Repeller. About 20 of them are professionals, and all of the rest that you see in the pit are the so-called tourists. Most professional photographers have journalist credentials from the magazines they work for. This makes it easier for them to get press passes from the communications agencies organizing the shows. However, when you are in the initial stage of the development of your fashion and runway photography, you have to look for alternative ways in. When I started doing runway photography in the summer of 2018, my blogger friend, Tommy Tomova took me to shows and introduced me to her network of bloggers. As a result, I got the chance to both shoot runways and to collaborate with bloggers from all over the world shooting street style. This was an opportunity to both get experience and exposure in the process. 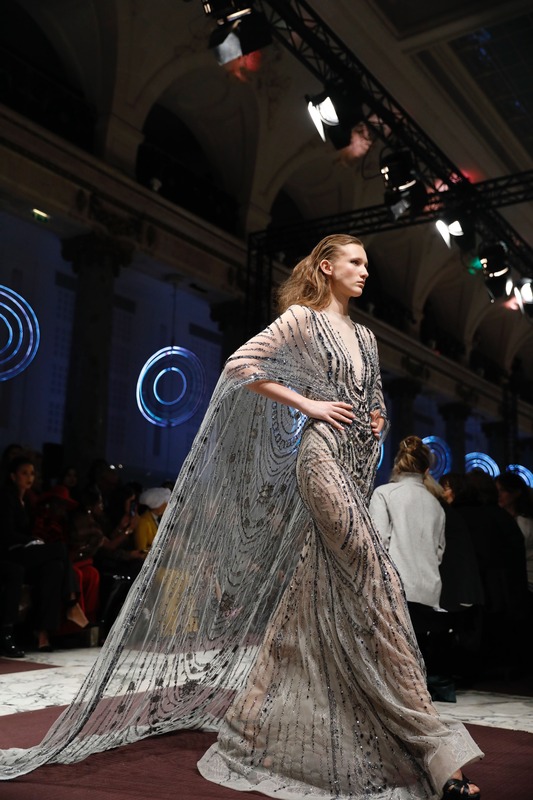 The next haute couture season, I already had a portfolio showing my work, so I felt more confident when I reached out to the agency which organized the Ziad Nakad FW ’19 show. By sending them my work, I was able to get an invitation and attend the event. Knowing I am just one of those tourist photographers, I realized I don’t have another option but to smile my way into the front row in order to get the best spot possible in the pit. I scan the front line, and I notice a handbag sitting in a tiny free space next to the crew of France 24. I negotiate with the photographers guarding the spot for someone else, and I squat on the floor ready for the show to begin. The girl whose bag I had replaced comes back and wants to sit. At that moment, nothing could make me leave. Therefore, I scoot left, and find myself between France 24’s tripod’s legs. We started talking and it turned out she was a tourist herself. Her name was Lucille and she was Parisian. Although she had been shooting for PFW for a couple years, she still hadn’t gotten the privilege to be entitled to a seat in the first row. So, I started wondering what it actually takes to get that front row spot. “The photographers pit has no rules, the fashion shows have no rules for the audiences either. It all works on a first come, first serve basis,” says Lucille while we are waiting for Orion to begin. The show is late. I have been completely squashed under the tripod of France 24 for half an hour. I am running late for the next show. I feel like I might never be able to walk again from the pain in my bended knees. None of that matters anymore as the lights go out and the first model starts walking. I get the chance to take those pictures that would turn me from a “tourist” into a professional photographer. The truth is, you get the right to be in the pit, by being there, taking good pictures and getting recognized.